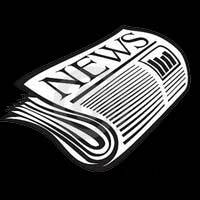 Fire Marshal’s Update – March 2018 | F.F.A.M. Heavy rains have finally come along the southern part of the state at the end of February, filling lakes and ponds, and saturating the vegetation. Brush and grass fires were keeping the locals plenty busy over the last several weeks. Hopefully this rain will relieve that, and allow the vegetation to grow and give fire departments some much needed relief. The Division would like to congratulate the University of Missouri Fire and Rescue Training Institute (MU FRTI) for another successful Winter Fire School. I appreciate Kevin and his team making a top shelf winter and summer fire school available to our state. We appreciated Governor Griteans stopping by and walking through the expo shaking hands and taking pictures. We appreciate him taking time to show his support to the Missouri fire service. Thanks to everyone who dropped by our booth and said “Hi.” I know our staff enjoys seeing you. I enjoyed getting to work within the fire school command staff, and seeing many of our great firefighters attending classes, and getting educated on many different topics. This makes me proud to be part of you! It is time to go to your computer and register your department with the Division. Matt Luetkemeyer sent you an email in December, which contained a link to your department’s data. Click on that link and it will open your data from last year. Update your information if needed. If not click submit, and you’re registered. We have 856 departments within our state. In 2017, 613 of you registered. It is important we have accurate information for your department. Please help us keep our information current. You can help by checking with your neighboring department, or bring it up during your county fire chief’s meetings. 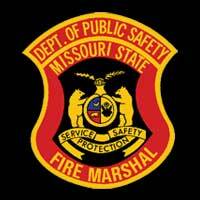 Let’s beat last year’s number and have 100% of Missouri’s fire departments registered. 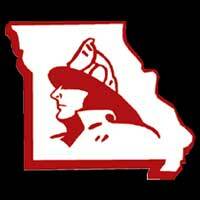 If you have never registered with the Division, go to: dfs.dps.mo.gov and click on fire department registration, fill out the form, and push submit. It is a State law that you register your department annually. If you have questions please call, 573-751-2930 and ask for Matt Luetkemeyer. Matt and the Division mutual aid coordinators have been working with SEMA in updating the MoSCOPE (Mutual Aid Plan). We hope to have the updated plan out shortly. We would like to say, “Thank You,” to everyone who helps their neighbors with auto/mutual aid, day in and day out across our State. We have a great network of departments across our State which makes the fire mutual system work seamlessly. Because of working together, lives and property are saved, making for a better place for us to live and raise our families! Twelve members registered for the Firefighters Veterans Initiative. On February 17, the Division of Fire Safety made history. We kicked off the first ever Firefighters Veterans Initiative. Governor Greitens challenged us to create an initiative to attract veterans, and military in transition personnel to consider career or volunteer opportunities within the Missouri fire service. 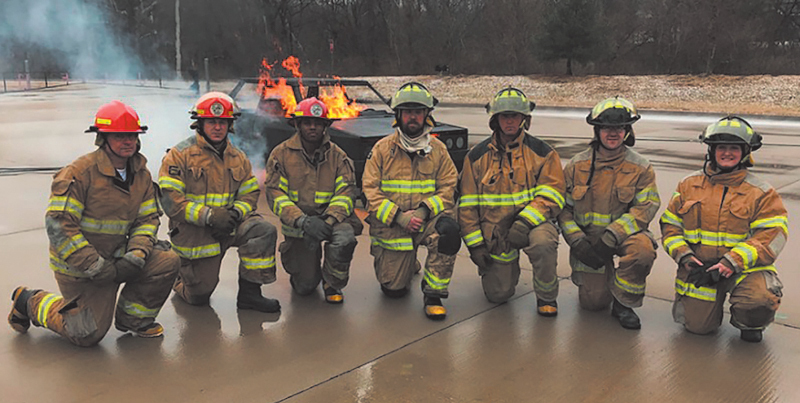 We had twelve members register for our pilot initiative, with seven showing up at the Jefferson City fire department training grounds on a cold snowy morning. Our committee was comprised of over a dozen fire departments, ten training partners, the veteran’s career skills personnel, and higher education representatives. The candidates experienced a short welcoming video and testimonies from two present firefighters who have transition from the military into the Missouri fire service. We shared information about their GI bill, which could pay for their training, along with what the initiative was intended to accomplish. After a safety briefing, we then took them to the fire bay where they were fitted with full turn out-gear along with an SCBA. Each candidate was assigned to a team leader who took them to each skill evolution and answered questions and mentored them. 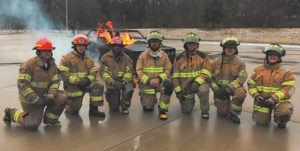 We had seven stations for them to complete, and ended with a live vehicle fire demonstration by Jefferson City Fire Department compliments of MU FRTI. The weather was a little cool and rainy but the candidates were very positive about their experience and gave some great feedback to make the initiative even better going forward. A live vehicle fire demonstration by Jefferson City Fire compliments of MU FRTI at the Firefighters Veterans Initiative. 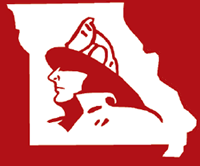 Additional Firefighter Veterans Initiative deliveries are scheduled for the Cassville Fire Department on April 28, the Springfield Fire Department on May 12, along with other site locations to be scheduled in Blue Springs, Popular Bluff, Ft. Leonard Wood and St. Louis. We invite anyone who would like to participate in the initiative to contact us. Something else coming out of the Division to look for is, Sound the Alarm, sponsored by the American Red Cross. They have a free smoke alarm program available for you. We hope to implement a statewide program to get each and every fire department access to the free smoke alarm program. If you would like information about this please email me at tim.bean@dfs.dps.mo.gov and we will get you set up. I am sad to report as of this date, we have investigated twenty-two fire deaths for the year. Our fire investigators expressed that this is the highest they know of for years. We are currently analyzing data to identify if there is a common theme. We know the prolonged cold weather has been partly to blame; however another common cause which caught my attention is smoking with oxygen. When we finalize our analysis we will disseminate it to you so you can use it for educating your communities. If you have a fire death please contact us so we may assist and/or collect the data. We are still working on the firefighter training standard. I am pleased to say many of you have brought the basic firefighter course to your departments. The training division has seen a spike in course completions, which makes us happy. The language has been submitted to DPS and we will see how it goes. The fire training funds looks good for now in the Division’s budget, but as you know we are still early in the process. In the training unit, the Inspector II course pilot rollout will hit the streets in March and April. The NFPA 1403, Live Fire course is also being delivered across the State. If you plan on doing a Firefighter I-II, your fire burn evaluators must be 1403 certified before we can certify your class. Call for more details. We are making an effort to bring regional testing to you, using our training staff as well as our fire inspectors/investigators. Please check with us before you drive here for a certification test. We know people like getting their test results the same day, and we are looking at how we can do that in the regional setting. We are researching avenues for online testing, and a funding mechanism for such. Last year the training unit proctored 4,153 certification exams. That’s a lot of “J. Tim Bean’s,” but I sure don’t mind signing them all, because it shows we have trained and educated first responders. Finally we have free parking available for testers. When you go to register you can print off your parking pass. It will allow you to park on the top of the State parking lot. Make sure and display the permit on your dash. We hope this makes your testing experience easier, and save you a little pocket change. We want to congratulate the two recipients of the Division of Fire Safety’s 2017 Training Officer of the Year. Scott Naumann of the Rolla Rural FPD is the volunteer recipient, and the career recipient is Mark Jenkins of the Columbia Fire Department. Job well done fellows! Thank you for leading from the front! The Annual Fire Fighters’ Day at the Capitol is April 4, starting with an 8:45 a.m. briefing on legislative issues. The ceremony in the rotunda will begin at 9:30 a.m. and then we will dismiss everyone to meet with your legislators. Free lunch will be provided at the Governors Garden. It will be moved to the thirteenth floor in case of inclement weather. Due to construction being done around the Capitol there will not be any outside displays this year. Come join us for a special day of fellowship, friends, and food! 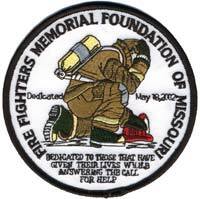 In closing I want to say, thank you for all of the support Judy and I have received from the Missouri fire service. We celebrated our first year with the Division and you. We have enjoyed serving you and we look forward to working alongside you this year. Feel free to call, email, text or come visit us at the thirteenth floor. Remember to try and be the best boots on the ground, and leave things better than you find them!